A New Title from Two Worlds Press! 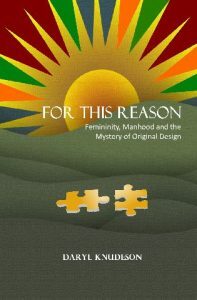 For This Reason – Femininity, Manhood and the Mystery of Original Design, the second title from author, Daryl Knudeson, is in the final stages of layout and proofing. For This Reason is an interactive study focused on taking a deep and brave look at our distinctly feminine design. The questions woven into each section help equip women with the understanding of how truly amazing that design is, and give a fresh perspective of how we influence the men in our lives. As we examine the triumphs and failures in our own relationships, and scrutinize two “femme fatales” from Scripture, we learn how to successfully live out our unique design with a sense of grateful tenacity. Click here to get For This Reason. Check out Daryl’s first book, Sacred Story – Finding God in the Ordinary. This entry was posted in New Release, Two Worlds Press on January 15, 2018 by Two Worlds Media. I cannot wait for this study! I am so excited to see that it is in the final stages! I look forward to studying this with the ladies at my church. Thank you!